Welcome to the Sparkle N Sprinkle Fall Inspiration Blog Hop! 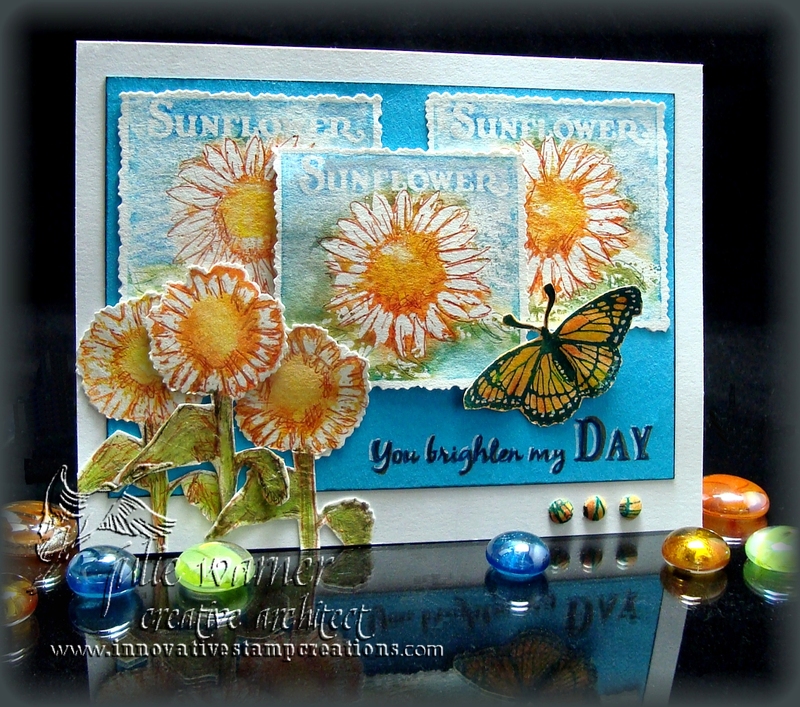 the beginning, at the SNS blog, so as not to miss anyone’s remarkable cards! This is a 2 day hop, 10/18/10 thru 10/19/10. Leave a comment at each person’s blog (if experiencing technical problems, e-mail SNS_Artist@tampabay.rr.com with your name in the subject field, and include a message about the artist’s card and which blog it was at). Follow the directions at the last blog to become eligible for a stamp set of your choice! 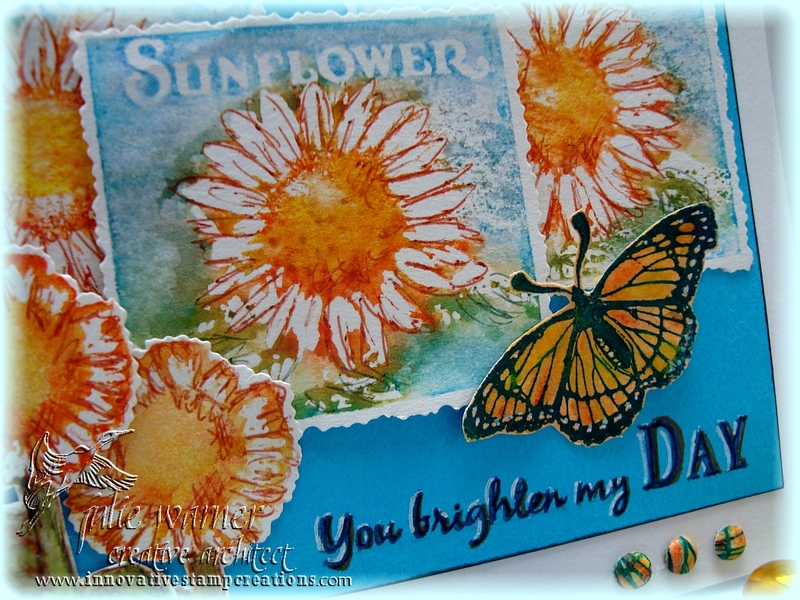 (You may have seen these cards on the Splitcoast Faux Brad Tutorial which debuted 10/13/10.) 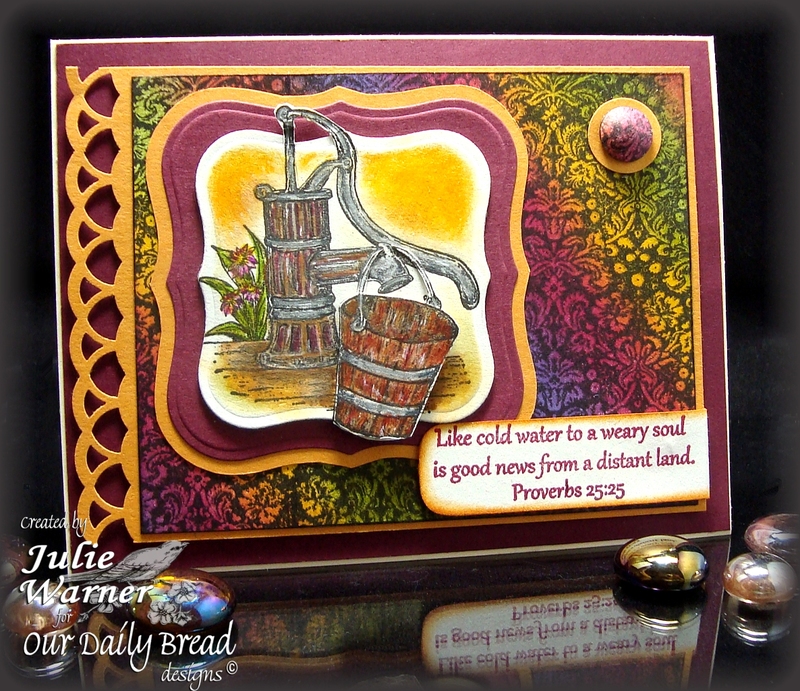 For both of my cards, I used the Autumn Swirl set 410. Isn’t it lovely? For the first card, I used a rainbow ink pad for the tree, greeting and 1/2″ faux brads. I used a Spellbinders rectangle to cut it out and a petite oval for the greeting. On the horizontal mustard layer, I stamped another of the swirl images using part of the Autumn Leaves Kpad. The sentiment was die cut using a petite oval nestie. The faux brads were made using a scrap of the vanilla which I first stamped w/ the swirl images using the Kpads. These faux brads are 1/2 inch. Finished card measures 5.5 x 4.25 (A2). 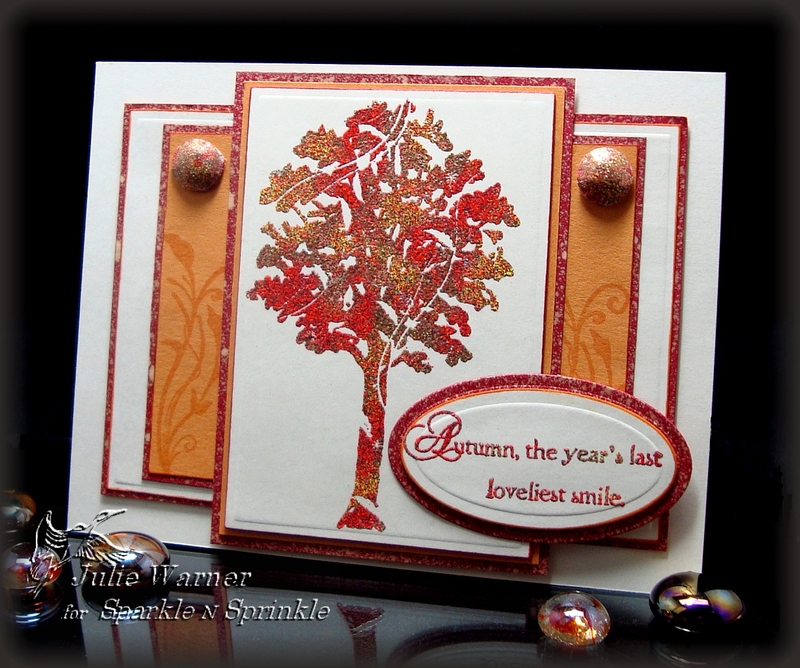 For this second card, I used the same images and layout, but “painted” my tree with 3 different embossing powders. The swirly tree image was stamped w/ VM and I used the 3 embossing powders and a technique I call “painting w/ ep”. I used a rectangle nestie to cut it out. Two very narrow mats, 1 mustard, 1 rust (spritzed w/ bleach), back it. On the horizontal mustard layer, I stamped another of the swirl images using part of the Autumn Leaves Kpad. The sentiment was die cut using a petite oval nestie. The Faux Brads were made using a scrap of the vanilla which I first stamped w/ the swirl images using VM and sprinkled w/ the embossing powders. These faux brads are 1/2 inch. Finished card measures 5.5 x 4.25 (A2). Thanks so much for stopping by! 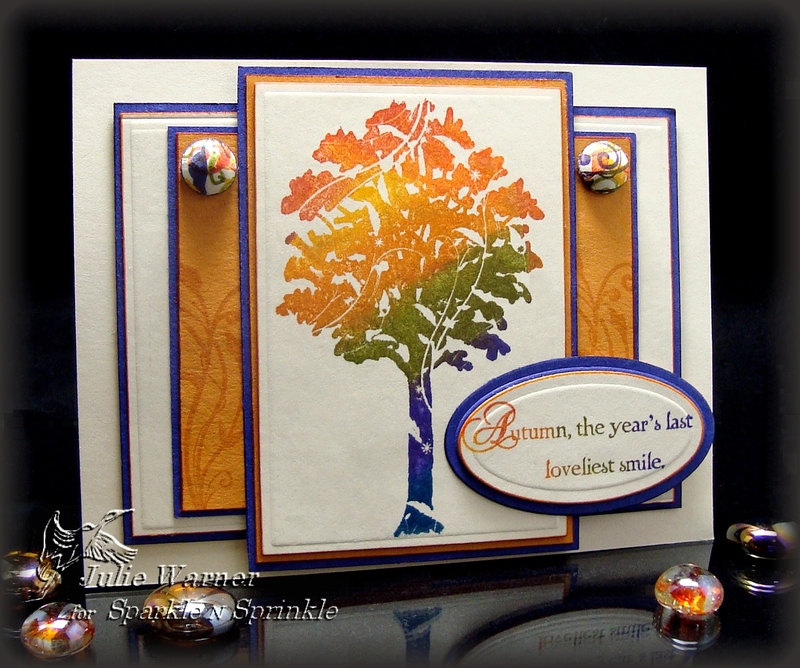 To continue the hop, please visit Sandy Meier who will be sharing her lovely Autumn inspired design. This card was made for two challenges at Splitcoast: yesterday’s Featured Stamper (FS192) and today’s Technique Lover’s Challenge (TLC294). For the FS challenge, I chose Jenn’s CAS Trees. I kept the 3 repeated images and horizontal layout, but used different images and offset them slightly. I also changed the colors. 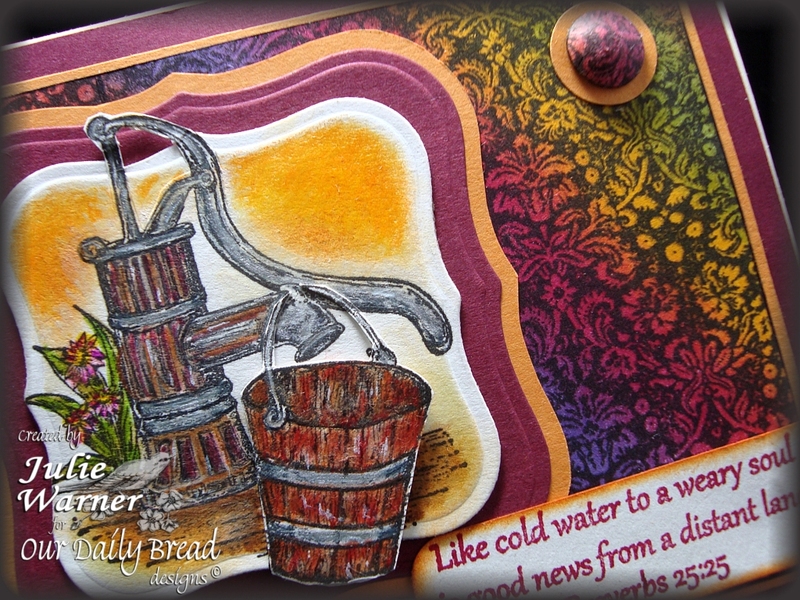 For the TLC challenge, I used damp water color paper but instead of stamping with ink, I scribbled water color crayons directly onto the stamp, misted it, then stamped onto the w/c paper. All images are Innovative Stamp Creations. After I colored, misted and stamped the sunflower block individual sunflower 3 times, I used a lt brown gel pen to add a little definition and cross hatching to the images. 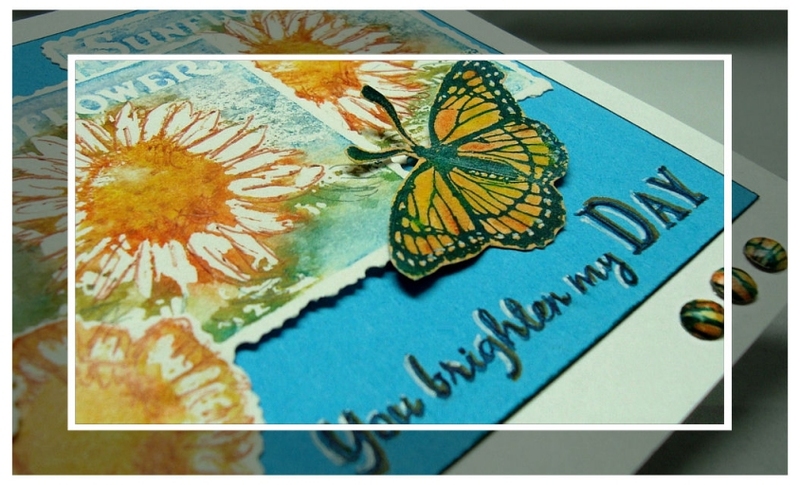 I used deckle scissors to cut out the blocks and attached them to a piece of turquoise card stock. I stamped the greeting in the lower right then used a white gel pen to highlight and a dk orange pen to shadow the letters. It’s attached to a white, 5.5 x 4.25 (A2) card. The sunflowers were added and a cut out butterfly. I made 3 faux brads and attached them to the lower right card front.